I'm not sure why it is that I am so quick to criticize myself. I seem to have a program in my head that is all about judging myself and finding fault. When something goes wrong I can hear that little program/voice saying "I told you so, sooner or later you had to stuff it up!" Logically I know that this stems from a childhood of being the oldest child and always trying to be perfect, but it is so hard to shut that voice up! When you are a perfectionist like me, all the little flaws I find in myself seem to be magnified and merit way more attention than they deserve. I HATE making mistakes, I HATE having my trust betrayed, I HATE things happening in ways that weren't how I'd planned for them to turn out. Funnily enough, the hiccups in life are good for me - they stretch me and make me realize that I can't control everything. They open my eyes to the fallibility of myself and other people. I learn far more from my mistakes than I do from my successes.......BUT I still HATE it when I stuff up. Midlife is teaching me to let go of some of my perfectionism. I'm learning to lighten up a little and to place less importance on what that little nagging voice has to say. I'm slowly gaining enough self confidence to know what my strengths are and to be able to celebrate them without apology. I am really good at a lot of things and I'm getting better at other stuff each day - and that is worth celebrating. I think I've reached a point where the armchair critics can have an opinion and I can let that go through without having to explain myself or agree with them. I can can tell the little voice in my head to shut up (I'm allowed to do that because it is my little voice) and I can ignore the naysayers and keep moving forward. Nobody needs to decide how I live my life or what my priorities should be. My reasons for doing what I'm doing are mine alone and my accountability is to myself first and foremost. The only person who gets any say in it at all is me (and maybe my husband if he is lucky! And supportive!) All I have to do now is keep the volume turned down on the inner critic and turn up the volume on the inner cheer squad and I'm on my way to having a pretty fabulous life. I hope others are finding the same joy in trusting themselves more and having confidence in their decisions and choices. I think we've often squashed our inner cheerleader into a corner and listened to the wrong voices and missed out on the freedom that we are entitled to. Lets be brave enough to embrace who we really are and get on with living the vibrant life that's out there waiting for us. I may go too far the other way sometimes. you're my hero Carla - I'm working on killing mine off as soon as I can work out how to do it properly! This is an area that I'm constantly working on too, Leanne. The good thing about midlife is that I'm finally making peace with who I am and starting to like ME. Thanks for the reminder though, it's always welcome. I'm a comparer too Lianne - definitely a work in progress but I'm finding myself more all the time and that means there are less comparisons! Here-Here, Leanne! Though the annoying voice rears it's ugly head, I just tell it to shut up. me too Glenda - it's always there but you can push it down and move on - we don't have to listen to it! I've certainly learned some lessons from the tough times Jodie - and allowing myself a little grace and recognizing how far I've come is where I'm at today. So true, yet sometimes so hard... Great post! I'm glad I found you at #MadMidWeek linkup. Hi Dawnita - lovely to meet you - and yes it's quite hard sometimes (especially when I'm trying to do something new!) but I'm learning that I'm my own worst critic and that is crazy! I love this post! I really love your graphic and the quote that says "I am walking my own path, your approval is not needed"! Letting go of other people's approval is something really hard for me Gigi - I think I'm getting there most days, but I still fall back to it sometimes. Blogging has made a huge difference in that areaa! As they say, perfection is the enemy of good enough. If we wait for perfect, we often wait and wait and it never happens. Thanks for the great reminder! 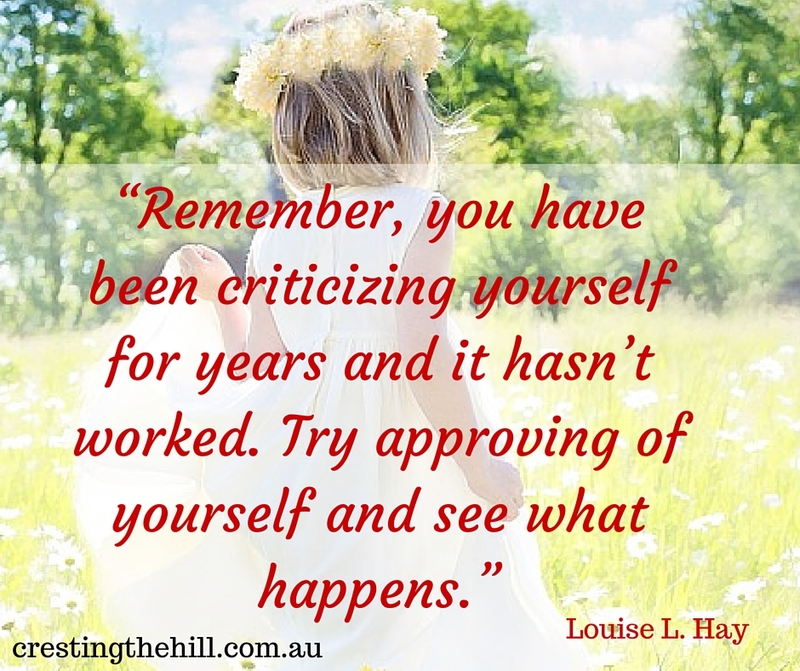 That's so true Laurie - I'm not sure how that perfectionism creeps in. it's good in small doses but a killer if you let it take control. You're right in the fact that it slows us down. I can totally relate to the perfectionism, and I, too, can beat myself up for making a mistake. This was a great write-up. Leanne, good for you. I am much harder on myself than I ever am on anyone else. I think it's just my personality, I still haven't got that inner critic to silence itself. But I'm working on it. I've got to stop trying to make everyone happy and figure out the best way to do things. And when I ask someone else's opinion I also have to realize that they are not walking in my shoes and that my decision may never be their decision and to stop beating myself up for it. I'm working on it thanks for the reminder, I think I need a bit more work. I heard once the question "if you talked to your friend the way you talk to yourself, would you still be friends?"... UUGGHH!!!! NO!!! So I am trying to get that inner cheerleader out more often! Thanks for this encouraging post! I'm a bit the same Vicki - I would never say to a friend the things I regularly say to myself - that little inner critic has a lot to answer for! You're right Leanne. You have to cheer yourself along as you go, otherwise those who do the opposite will stand a chance at derailing you. Sorry Leanne, I mean your post. You won best post. I am recommending your post be featured on my site this Friday. What a great post! Thanks so much for linking up with the #MadMidWeek linky. my accountability is to myself first and foremost. What an important thing to remember. And with that clarity so many other things fall into place.